If you want to bake Christmas cookies, then we have the baking sheets! 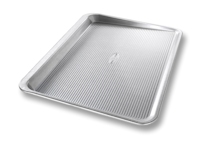 USA Pan bakeware has been designed with many of the same standard features as industrial baking pans. Each pan is constructed of aluminized steel, the material of choice for commercial bakeries. Metal thicknesses have been selected that allow even heat distribution. USA Pan bakeware is corrugated, and that corrugation maximizes pan strength and prevents warping. Corrugation also minimizes surface contact with baked goods which translates into an evenly baked product that is easily released. Made in the USA!